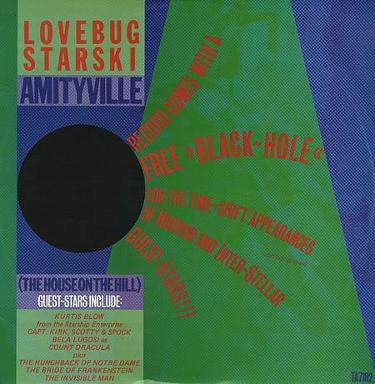 LOVEBUG STARSKI "AMITYVILLE (THE HOUSE ON THE HILL)"
Amityville (The House On The Hill) became the only major hit for Lovebug Starski, reaching #12 in the UK. The lyrics (which are rapped in a style very typical of the 80s) are based on the true story of the Amityville horror, although the house isn't actually on a hill. I suppose, "the house in a leafy suburb" just wouldn't make for a very interesting song title! The track featured on his debut album House Rocker which was released on the Epic/CBS Record labels. The song also regularly features on Halloween party music compilations. The track featured on his debut album "House Rocker" which was released on the Epic/CBS Record labels. The song also regularly features on Halloween party music compilations. Lovebug Starski is certainly an intriguing name, although when your real name is Kevin Smith then you can't blame the guy for choosing something that stands out from the crowd. Born in the Bronx in 1960, the U.S. musician began his career performing in the hip hop clubs of New York. Lovebug released his debut single "Positive Life" in 1981 with the Harlem World Crew. In 1985, the DJ released a single entitled "Rappin'" which was the soundtrack to the film of the same name. Apparently, the DJ/rapper's musical career came to an abrupt halt when he was issued with a five year jail sentence, although he started DJ'ing again during the 1990s alongside DJ Hollywood. Sadly, Lovebug Starski died of from a heart attack on February 8, 2018, aged 57. He had just moved to Las Vegas to try an reignite his DJ career.